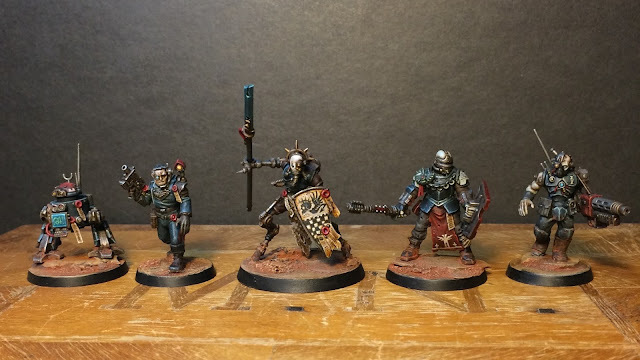 The mechanicvm warband is steadily growing. So much in fact I´m starting to think of splitting it into two factions. One "evil" faction led by Symmachus on a slippery slope towards heresy and ultimately the Dark Mechanicus, containing the more sinister models and one more straight shooting imperial warband. These will be led by an Inquisitor of the Ordo Machinvm (not yet constructed) hunting the wayward techno-heretics. Whaddaya think? Is it more interesting to split them up for a more straightforward narrative - a fight between evil and slightly less evil? 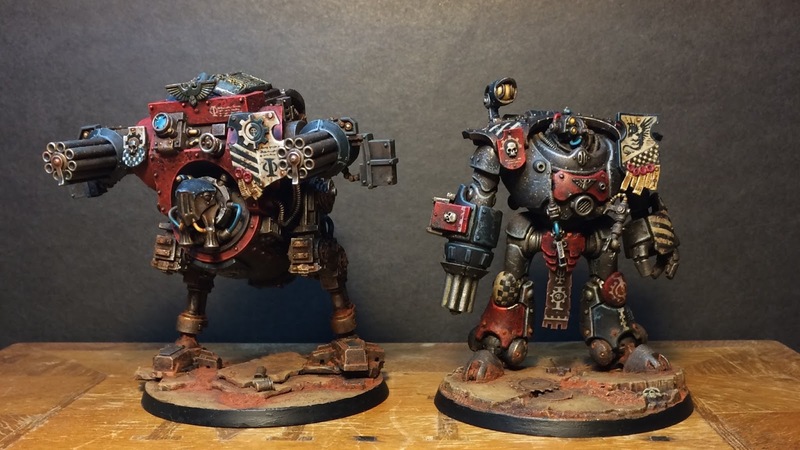 Or do one to keep them together for something more ambiguous - showcasing the many faceted face of the Adeptus Mechanicus and the darkness within? I like the idea of the two conflicted groups brought together on a common mission. Something with a B-movie horror feel, maybe investigating a Necron tomb world or a Genestealer infested research outpost. A situation where the tension between the groups rises against a backdrop of a much more sinister presence. Or you could have a shootout amongst some dominos and Lego on your desk, either way these guys look amazing. I love opening up your blog and seeing all your amazing work. It's really fantastic. You bring the grim dark to life. Applause. Well done! Because of the common paint scheme, I think the idea of all of the characters originally being part of the same group or purpose makes sense, and a schism within the band separating them into two conflicting camps. Perhaps their goals aren't even all that different, but their methods are what break them apart? Or just good old-fashioned corruption. I think, the Adeptus Mechanicus could be a little like the Inquisition. With different ordos and different views. An ordo could be some kind of STC hunters. Others could be interested only in alien tech. Others are more loyal to the Imperium and archivating alien tech in safe vaults. Other collecting tech and sell them on black markets. Biologis Magii could be interested in alien lifeforms. Etc. 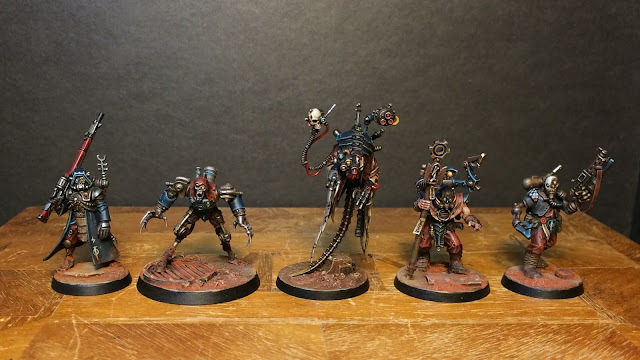 All miniatures of the Mechanicus your made could be loyal one...with different background, interests, goals and so on. Some top-notch input here. Thank you kindly gents! I´m leaning toward having them originally being members of the same explorator party with two rival magi - Symmachus and the yet unnamed one I´m working on. Under Symmachus influence, him playing part of the radical, some take a darker route under than others and they end up as enemies. Damn, those do look really good together. I adore your ability to kitbash truly unique and characterful models while staying really close to the feeling of the gothic future. Kinda makes my attempts at Orkz look rather inept. Love how the unified colour scheme makes all those wildly different minis look like a part of one force. That being said, I do like Smithy's idea of going with two adverse groups that end up being forced together. Pitting them against Necrons could work pretty well, seeing how Mechanicus have an insatiable appetite for those arcane technologies of eons past. I quite like the small touch-up you did to your blog, the monochrome colour scheme works really nice and helps focus on the pictures. Which now also seem to be available in higher resolution than before, which was my only gripe with the presentation of your work. I used to hang around a lot over there before I fell in with the inq28 crowd. Kitbashing ork stuff was a good training ground for me - you can be pretty sloppy when converting and focus more on simply being creative. Symmachus is going to hook up with Carax and his band of deviants, so I seehim as more interested in dark eldar tech. So no necrons at the moment I´m afraid, though you can´t rule that out of course! Glad you like the redesigned template - I think it a little slicker this way! The smallness of the pics is because I can´t change the size settings in bloggers iPhone app from which I normally post my stuff. Some bug of sorts. "I´m leaning toward having them originally being members of the same explorator party with two rival magi - Symmachus and the yet unnamed one I´m working on. Under Symmachus influence, him playing part of the radical, some take a darker route under than others and they end up as enemies."